If your beds have damage caused by root-feeding insects, you should consider treatment with Imidacloprid (e.g. Admire Pro, Alias 4F, Alias 2F) immediately after bees are removed. 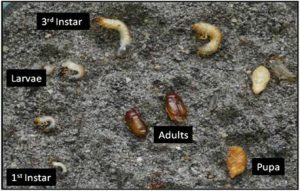 Occurrence of root-feeding insects will manifest by the presence of dead patches (see picture). Pull dead vines and search through the root zone and soil for grubs and worms. Admire Pro (imidacloprid) is labeled for the control of cranberry rootworm, white grubs (Phyllophaga spp. ), and other scarabs in cranberries. White grubs, Phyllophaga spp. There are several species of white grubs that infest cranberries in New Jersey, the most abundant being P. georgiana. Grubs are C-shaped and often found near bog margins. Adults are reddish brown and nocturnal. Grubs attack the cranberry roots; adults have not been reported to feed on cranberries. 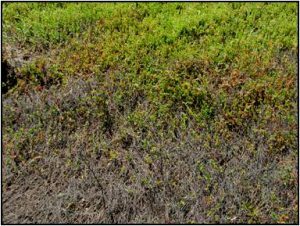 See pictures of grubs and grub damage in cranberries. The life cycles and abundance of white grub species in New Jersey is not well known. 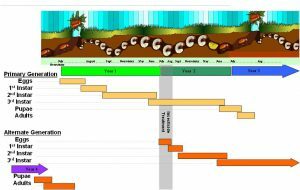 Most likely, Phyllophaga grubs have a 3-year life cycle (based on previous reports and our own observations). Eggs are laid in late-June and July, and will hatch in July. First instars can be found in late-July and August and turn into second instars by the end of August-September. The second instar grubs will overwinter. These grubs will feed the following year until June and molt to third instars, which will overwinter. The following year, the third instars will feed for some time and then begin to pupate in June. Pupation will take place in July-August. Adults will appear in the soil in August-September. Adults will remain in the soil and overwinter. They will emerge in June, mate, and begin to lay eggs, completing the cycle. Cranberry rootworm (Chrysomelidae). Pupation starts in late May and beetles emerge in early June. Adults are nocturnal and hide in leaf litter. Adults can be easily picked up in a sweep net. Females feed on foliage before laying eggs. Young larvae will feed on roots, feeding continues until October. The mature larvae move down the soil in the fall to overwinter. Holding of the water will delay onset of pupation. Rootworm has a 1-year life cycle. Entomopathogenic nematodes (Heterorhabditis bacteriophora) can be used to control cranberry rootworm. nervous system. It is highly systemic and toxic to honey bees; therefore, can be used only as a post-pollination insecticide. Imidacloprid can be applied by ground or by chemigation. Aerial application of this product is prohibited. Imidacloprid has a long residual activity (> 100 days) as long as the insecticide is not directly exposed to the sun. Admire Pro can be used at 7-14 fl oz/acre. A maximum of 14 fl oz of Admire Pro can be used per acre per season. The PHI is 30 days.